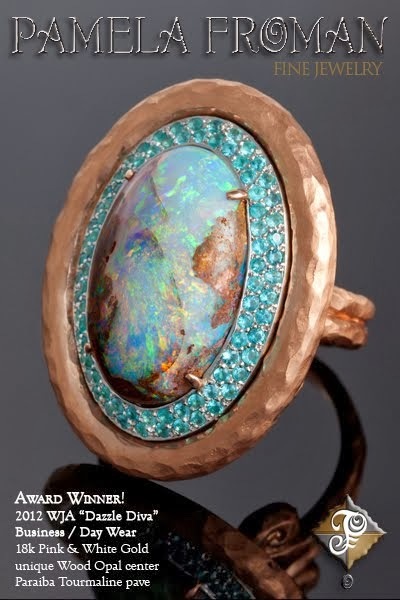 What motivated you to pursue jewelry design? I was majoring in fashion design at FIT in NYC and realized that the industry was not quite right for me so, I tried a few other courses: illustration, package design, interior design, window display and jewelry design. 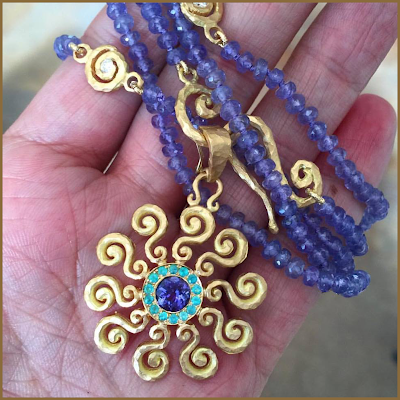 I was already making some jewelry for friends and selling the pieces at markets around NY, so it seemed like a natural transition to change my major to jewelry design. 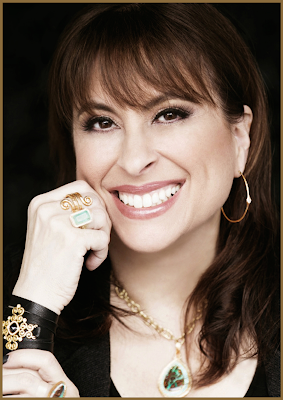 When I graduated, I moved to Paris and designed jewelry for couturier companies there for three years; it was such a great experience! I find it everywhere, in architecture, textiles, nature, in my dreams. Sometimes I wake up in the middle of the night and I’ve dreamt of an idea. I sketch and sketch for hours and, sometimes, just staring at my own jewelry gives me more ideas. I also play with my pieces in Photoshop a lot. Do you typically find the stones first and then come up with a design or vice versa? I do both. Sometimes, a stone calls out to me and I just have to have it and I know exactly what I want to design with it. Other times, I sit with a stone, sometimes for years, and I keep pulling it out and looking at it, and then the design comes to me out of no where! I also have pages and pages of sketches that I look through and end up having stones custom-cut to fit my designs. Does your design process change depending on whether you are designing fashion or bridal? Not really, except that wedding jewelry is mostly rings. 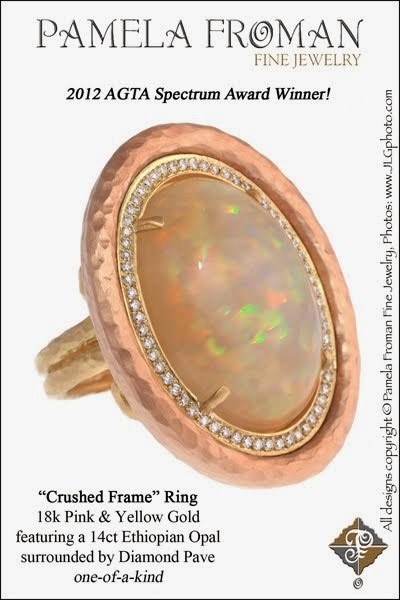 I have a few wedding pieces that are not rings but, when I am designing specifically for wedding jewelry, I concentrate on rings. 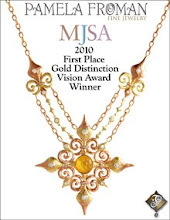 What do you enjoy most about being a jewelry designer? I love creating something that has come from inside of me and seeing the end result, like when I see a collector get such joy from owning a piece that came from my heart, it is the most wonderful feeling. I love gemstones, to me there are no semi-precious, all are precious and it just fascinates me that nature produces such beauty. Also, the jewelry industry is really great in general, filled with really cool and supportive people. 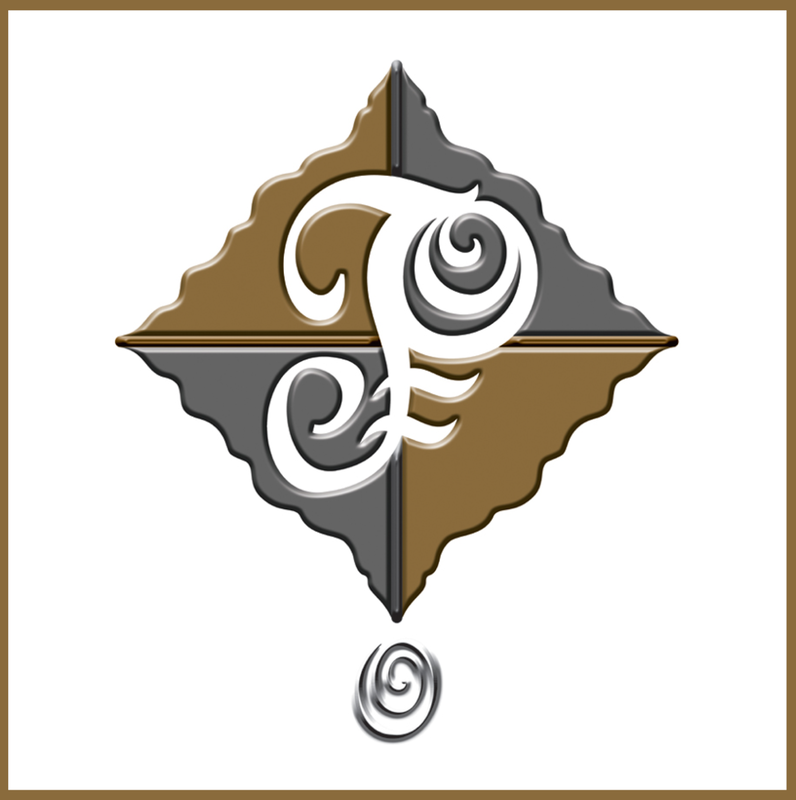 What is next for Pamela Froman? This year I launched an official “Wedding Collection”, I always had pieces in my line and have always sold wedding rings, but now it has been expanded into a full collection. I will continue to add to it. Also, eventually, I would like to expand into designing home goods and furniture and maybe even have my own retail store. 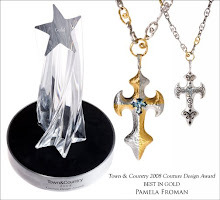 It is an honor to post about Pamela Froman and her fantastic jewelry. I love the way she mixes gold and the finish she puts on her pieces. 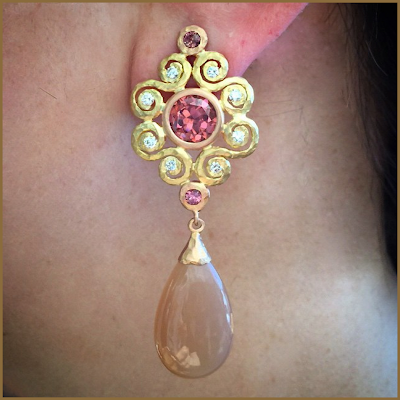 Her jewelry features some really intriguing stones and I love that she dares to put together unique color combinations. 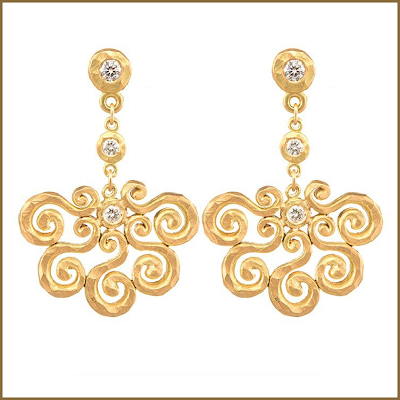 Pamela Froman Fine Jewelry features 18K gold in her fine fashion and bridal designs. 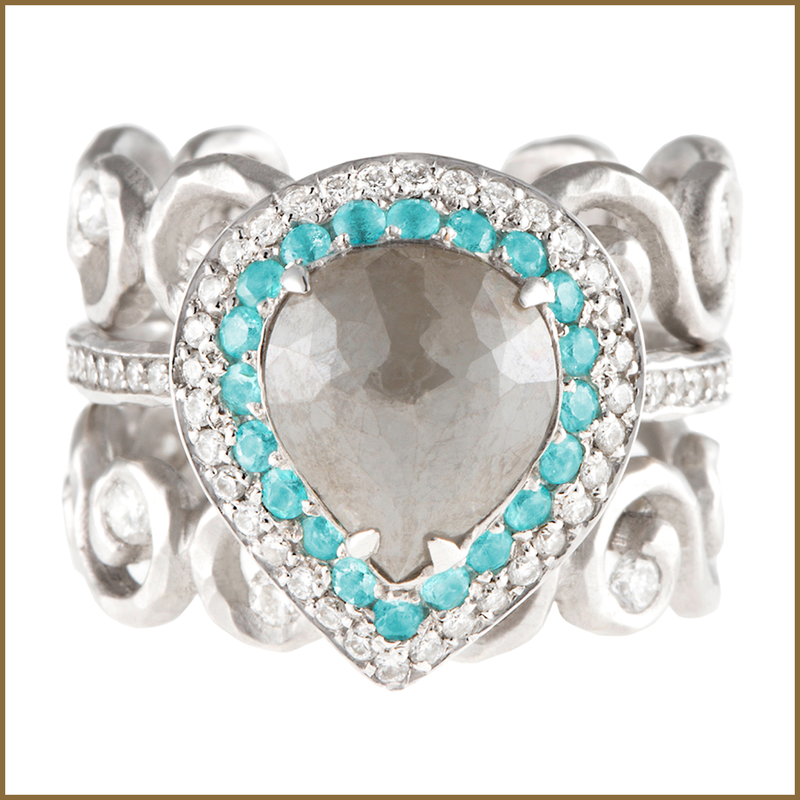 We love our retailers! One of the perks of being an independent designer is that you get to choose who you work with (to a degree, of course, because they have to choose to work with you too,) so, mutual adoration is a natural byproduct of our retail partnerships. Even knowing this, it's rare to get to see it all laid out in print, point by point, and read exactly why a retailer loves working with you. 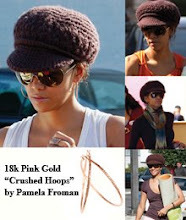 Customers love it because: "The crushed finish makes Pamela's pieces so wearable -- the line has a very natural beauty. The color combinations seamlessly mix colors of gold, which makes her pieces easy to accessorize and interesting to the eye. 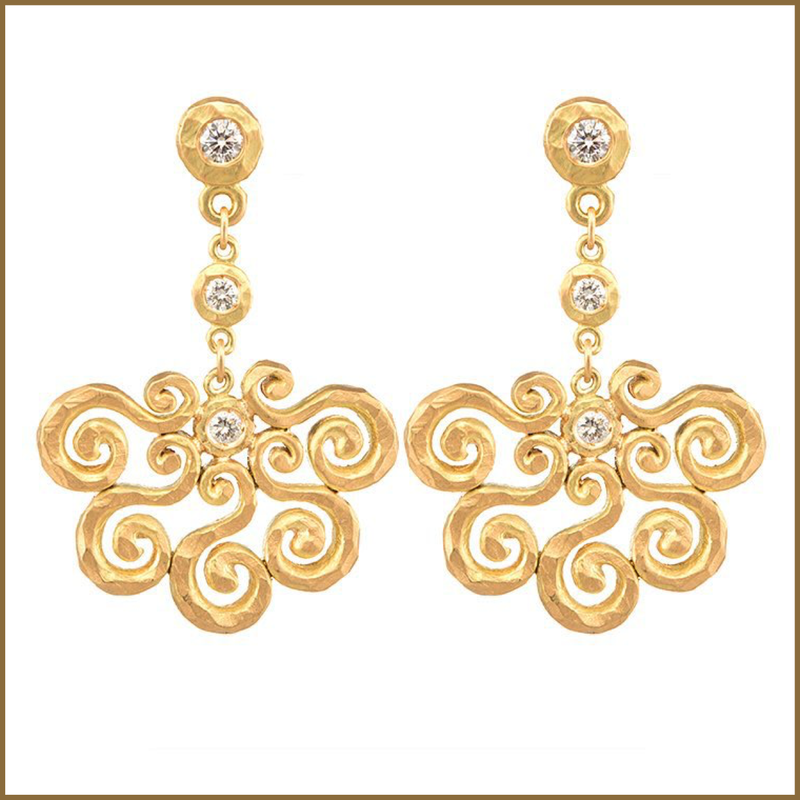 People also love that each piece is handmade and no two pieces are exactly alike." It's easy to sell because: "It just has such a pretty softness to it. And it transcends age and occasion. 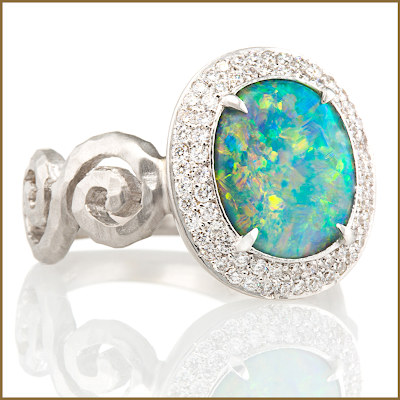 At our first Pamela Froman trunk show, every single person who came found something they loved. We couldn't recall that ever happening before." The most popular pieces are: "Everything with opals, her Headlight Hoop earrings, and her Dangle gemstone earrings. 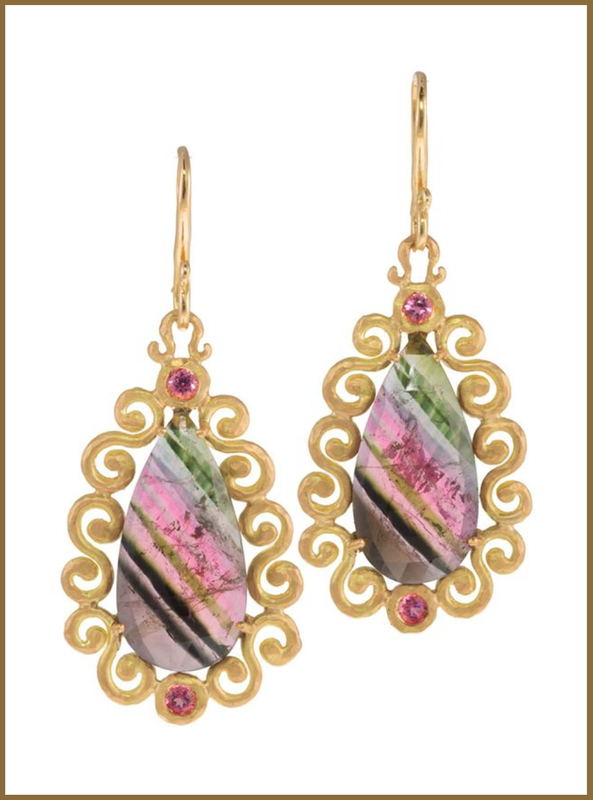 Her tourmaline pieces, too. 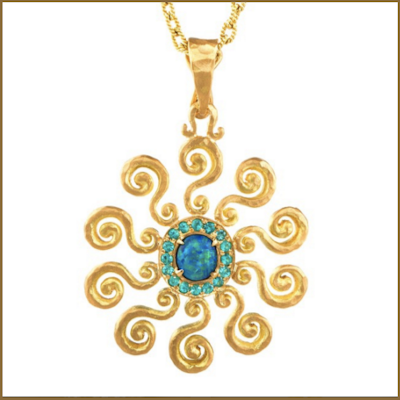 Her price points hover around $3,000 to $4,000, which gives the line a really broad appeal. We're always surprised at how many husbands come in and buy it for their wives. And then their wives come back in and buy more!" I like working with them because: "Pamela and her assistant Jilienne Hart-Arth -- who's been with her forever -- are an absolute delight. And Pamela always wants to make sure a design is exactly the way you wanted it. She's very humble, too, very appreciative, and very considerate. Like, if you have anything going on in your life, she remembers that. That's just the person she is." I'd recommend it to another retailer because: "We actually have recommended it to retailer friends in the industry! It's perfect if you're looking for a line that has a distinctive look yet broad appeal. It's not like anything else you're going to see. We have been nothing but thrilled since we began our relationship with Pamela." 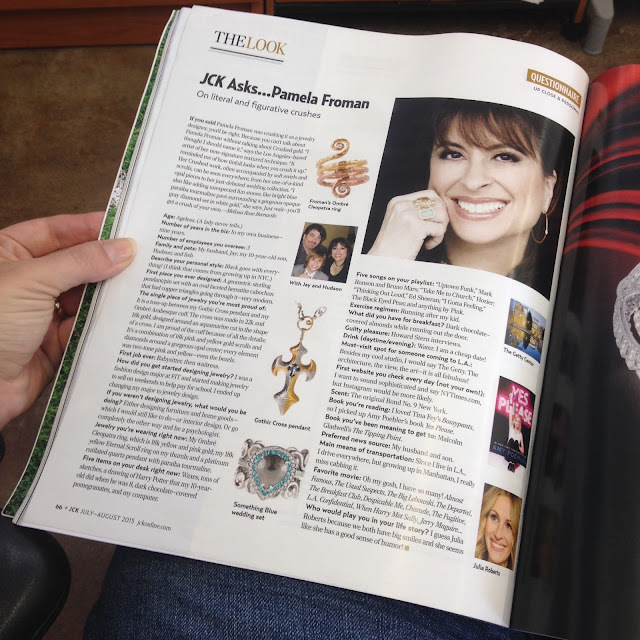 The brand new issue of JCK arrived today and I was so excited to see Pamela's smiling face when I opened it up! 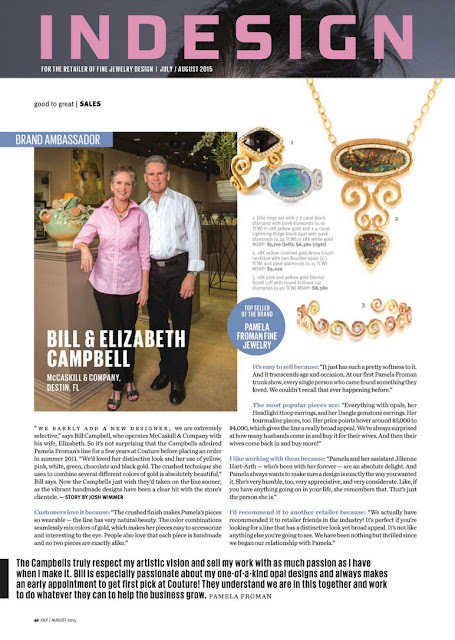 In case you don't subscribe to this fabulous jewelry industry magazine, I've transcribed the interview for you below. Enjoy the read, I bet you'll learn something new about Pamela Froman! 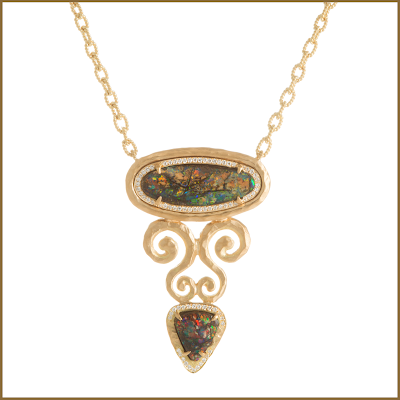 If you said Pamela Froman was crushing it as a jewelry designer, you'd be right. 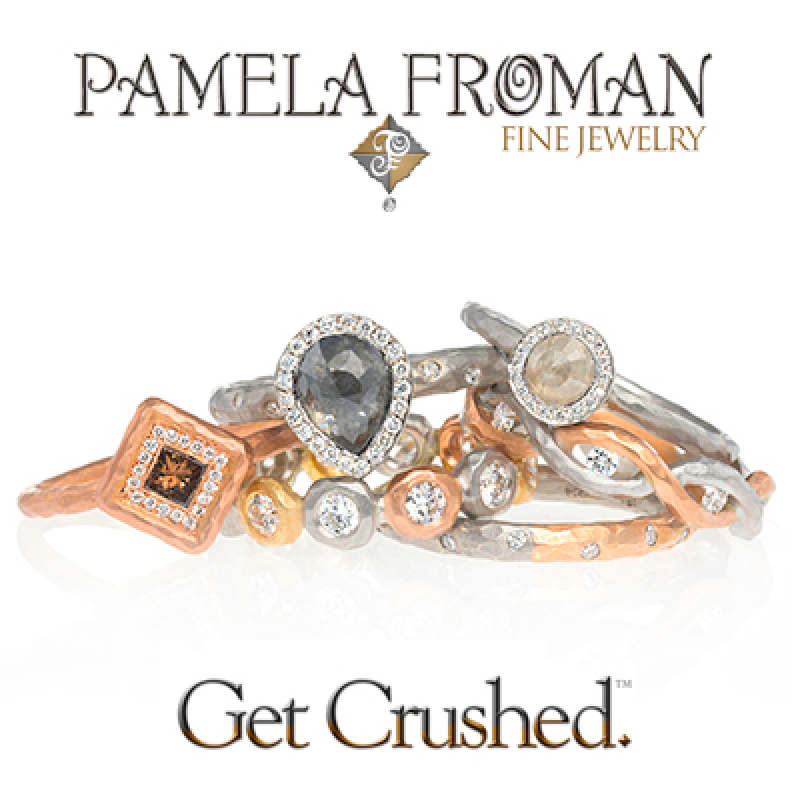 Because you can't talk about Pamela Froman without talking about Crushed gold. "I thought I should name it," says the Los Angeles-based artist of her now-signature textured technique. 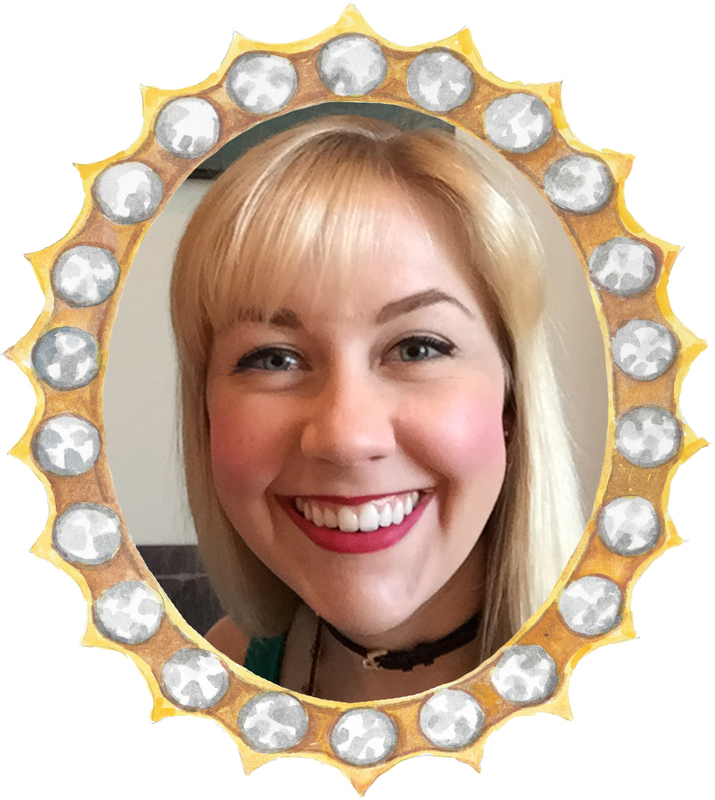 "It reminded me of how tinfoil looks when you crush it up." 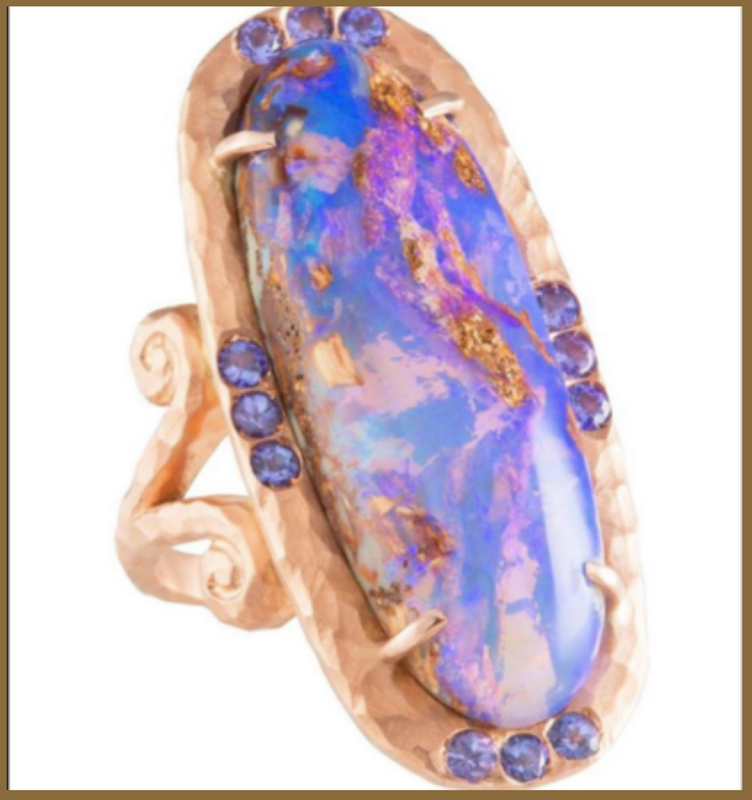 Her Crushed work, often accompanied by soft swirls and scrolls, can be seen everywhere, from her one-of-a-kind opal pieces to her just-debuted wedding collection. "I also like adding unexpected fun stones, like bright blue paraiba tourmaline pave' surrounding a gorgeous opaque gray diamond set in white gold," she says. Just wait -- you'll get a crush of your own. Number of years in the biz: In my own business -- nine years. Family and pets: My husband, Jay; my 10-year-old son, Hudson; and fish. First piece you ever designed: A geometric sterling pendant/pin set with an oval faceted hematite cabochon that had copper triangles going through it -- very modern. First job ever: Babysitter, then waitress. 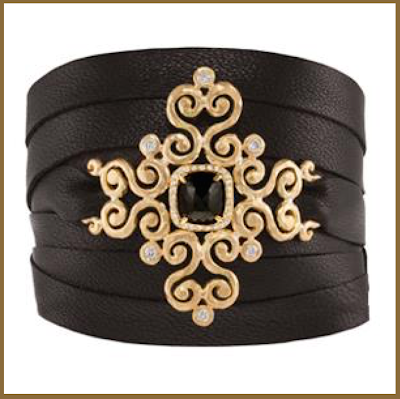 How did you get started designing jewelry? I was a fashion design major at FIT and started making jewelry to sell on weekends to help pay for school. I ended up changing my major to jewelry design. 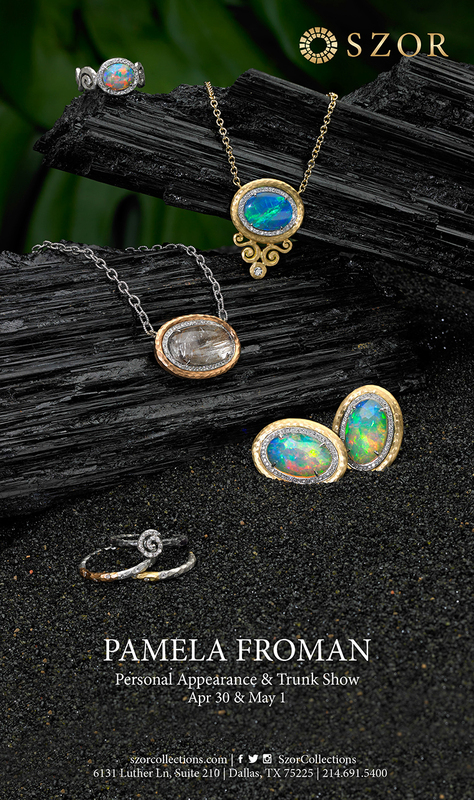 If you weren't designing jewelry, what would you be doing? Either designing furniture and home goods -- which I would still like to do -- or interior design. Or go completely the other way and be a psychologist. 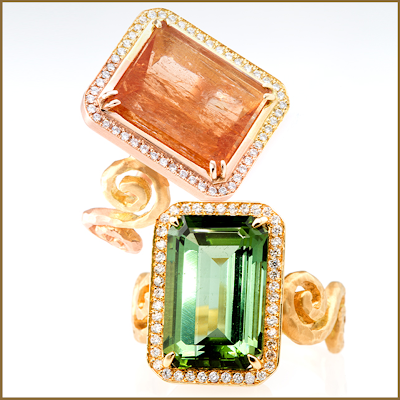 Jewelry you're wearing right now: My Ombre' Cleopatra Ring, which is 18k yellow and pink gold; my 18k yellow Eternal Scroll ring on my thumb; and a platinum rutilated quartz pendant with paraiba tourmaline. Five items on your desk right now: Waxes, tons of sketches, a drawing of Harry Potter that my 10-year-old did when he was 8, dark chocolate-covered pomegranates, and my computer. Five songs on your playlist: "Uptown Funk," Mark Ronson and Bruno Mars; "Take Me to Church," Hozier; "Thinking Out Loud," Ed Shereen; "I Gotta Feeling," The Black Eyed Peas; and anything by P!nk. Exercise regimen: Running after my kid. What did you have for breakfast? Dark chocolate-covered almonds while running out the door. Guilty pleasure: Howard Stern interviews. Drink (daytime/evening): Water. I am a cheap date! Must-visit spot for someone coming to L.A.: Besides my cool studio, I would say The Getty. The architecture, the view, the art -- it's all fabulous! First website you check every day (not your own! ): I want to sound sophisticated and say NYTimes.com, but Instagram would be more likely. Scent: The original Bond No. 9 New York. Book you're reading: I loved Tina Fey's Bossypants, so I picked up Amy Poehler's book Yes Please. Book you've been meaning to get to: Malcolm Gladwell's The Tipping Point. Preferred news source: My husband and son. Main means of transportation: Since I live in L.A., I drive everywhere but, growing up in Manhattan, I really miss cabbing it. Who would play you in your life story? I guess Julia Roberts because we both have big smiles and she seems like she has a good sense of humor! Pamela Froman wins WJA's Award for Excellence in Design!!! 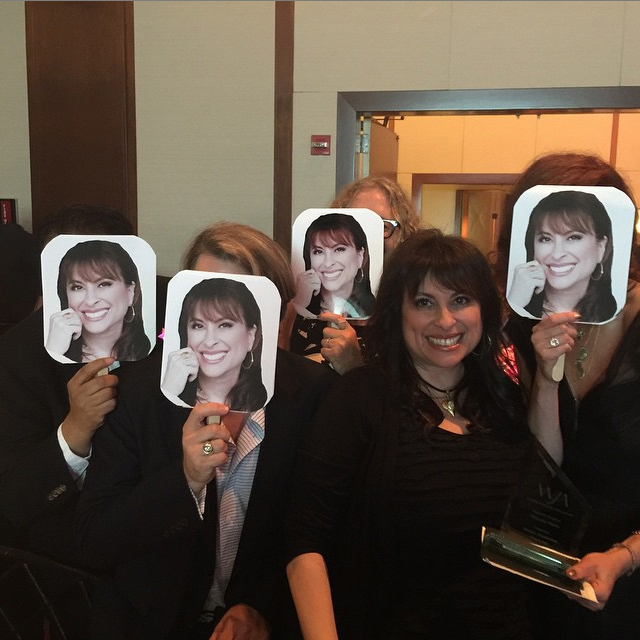 Jewelry industry insiders from across the country gathered in New York last night for one of the biggest events of the year! who have made their mark and continue to be an example for those newcomers. CJDG members showing their support for Pamela with signs they made from her headshot. Isn't this picture adorable? 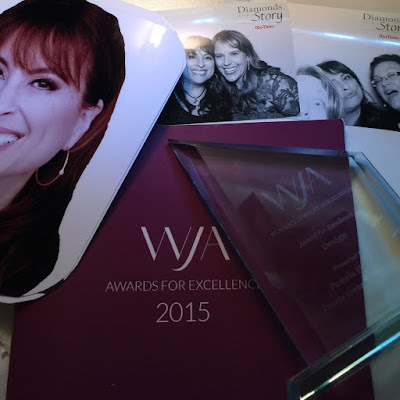 Pamela is incredibly honored and humbled to have been presented with the WJA's Award for Excellence in Design at the gala, joining the ranks of previous winners like Angela Cummings (1984), Lisa Jenks (2006) and Irene Neuwirth (2013), all iconic designers in their own right. 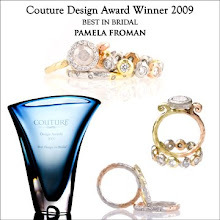 Pamela Froman has long made rings worn for weddings, but she decided to commit to the category wholeheartedly at the recent Couture jewelry show. Enter Froman’s new Wedding collection of largely one-off bands and rings made in 18k and 22k gold and platinum with diamonds and colored gemstones. Some 50 SKUs exist—about half were new for the show while others were already in her line—many with her signature Crushed metal texturing and two- and three-tone metal combinations (what she calls Harlequin and Mélange, respectively). For sure, the styles drove a lot of people to Froman’s booth. “We met with dozens of new stores this year, and we expect to convert at least half of them to new accounts, besides the ones that already bought,” she says. 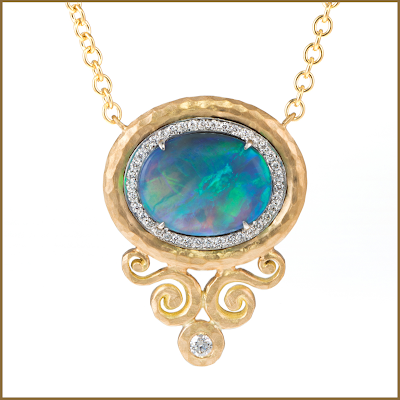 (About 10 retailers bought into the collection at the show.) As far as her unconventional looks—Tiffany-style prong settings aren’t her bag—she feels the time is right to celebrate über-personal statements. And when you consider the research on what Millennials want—quality, uniqueness—the prescience of her uncommon commitment styles is clear. “I feel like the world is changing—you can make your own statement and be your own person,” she adds. Stones of choice run the gamut from black opals to diamonds—gray, yellow, pinks—to morganite and more. “I use whatever stone I think will look good,” she maintains. 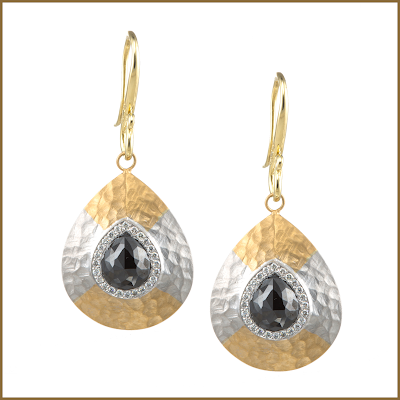 Among her fave combinations: gray center diamonds with halos of Paraiba melee. 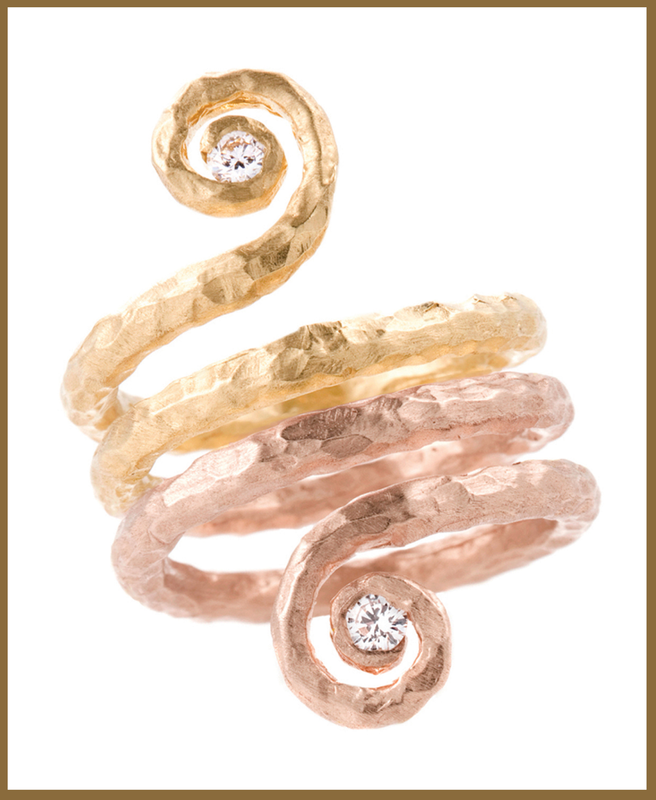 But singles needn’t be discouraged since many also buy Froman’s rings as right-hand styles and stacks. She’ll also set semi-mounts with CZs so that clients can choose centers themselves. Bands start at $1,000 retail while semi-mounts start at $1,200. Come visit Pamela and see her unique collection at the beautiful jewelry store Szor Collection in Dallas, April 30th & May 1st. Come Join us and see all the beauties! 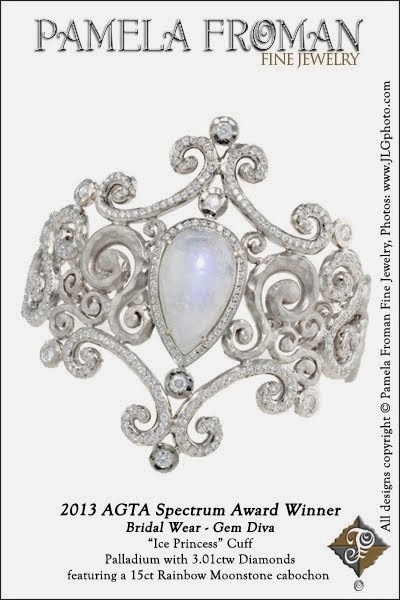 Pamela just won a WJA Diva Award for her transformational bridal design! 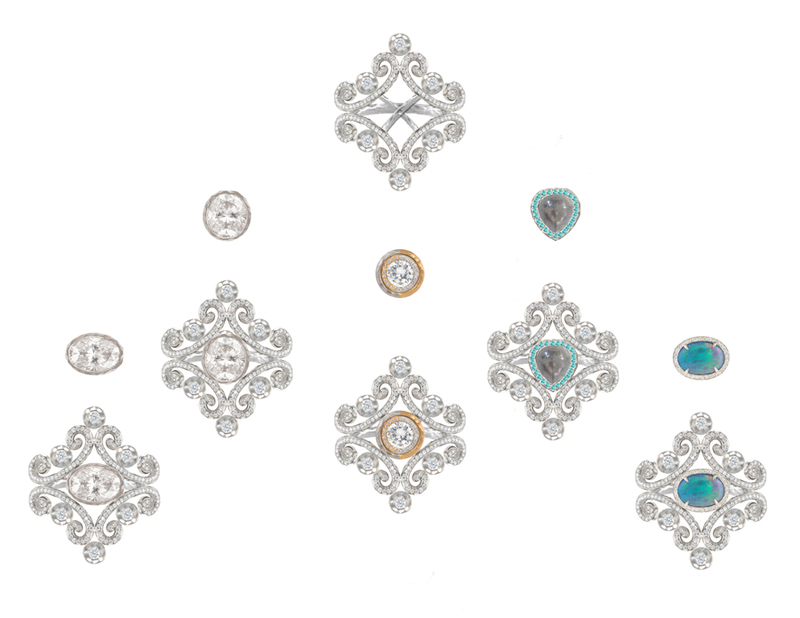 Award-winning ring design with interchangeable center stones: oval diamonds; round diamond with yellow & white gold diamond halo frame; opaque grey diamond with Paraiba tourmaline frame; Lightning Ridge opal with diamond frame. 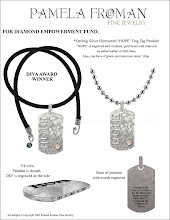 The winners of the 2015 WJA Dazzle Diva Design competition were announced this week and Pamela Froman took first place in the Bridal category! 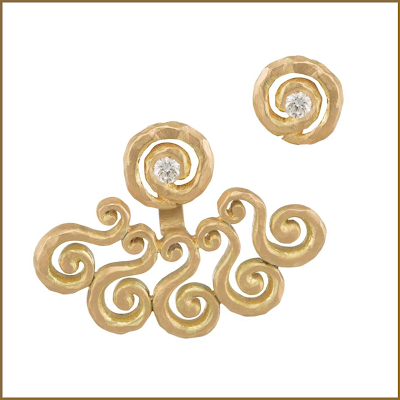 The theme of this year's Diva competition was "Transformation” which inspired Pamela to create an innovative engagement ring design that allows the bride to change out the center element of the ring depending on her mood or outfit. The way we see it, just because you’re committing to one person for the rest of your life doesn’t mean you have to commit to only one center stone, right? 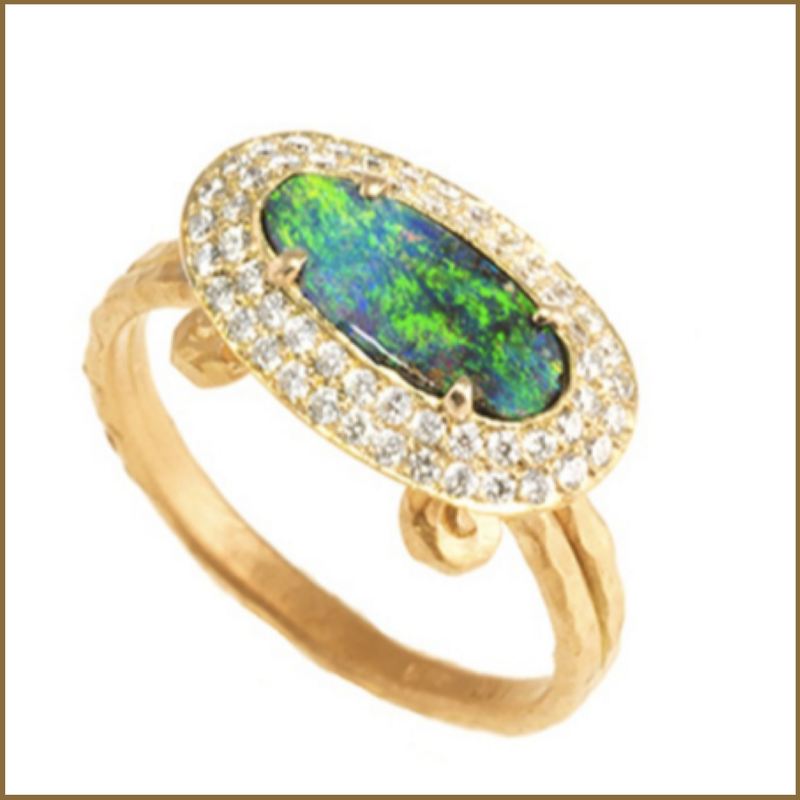 And with options such as traditional brilliant cut diamonds, rose-cut opaque diamonds, opals and more yet to be announced, you won't get bored with your ring. 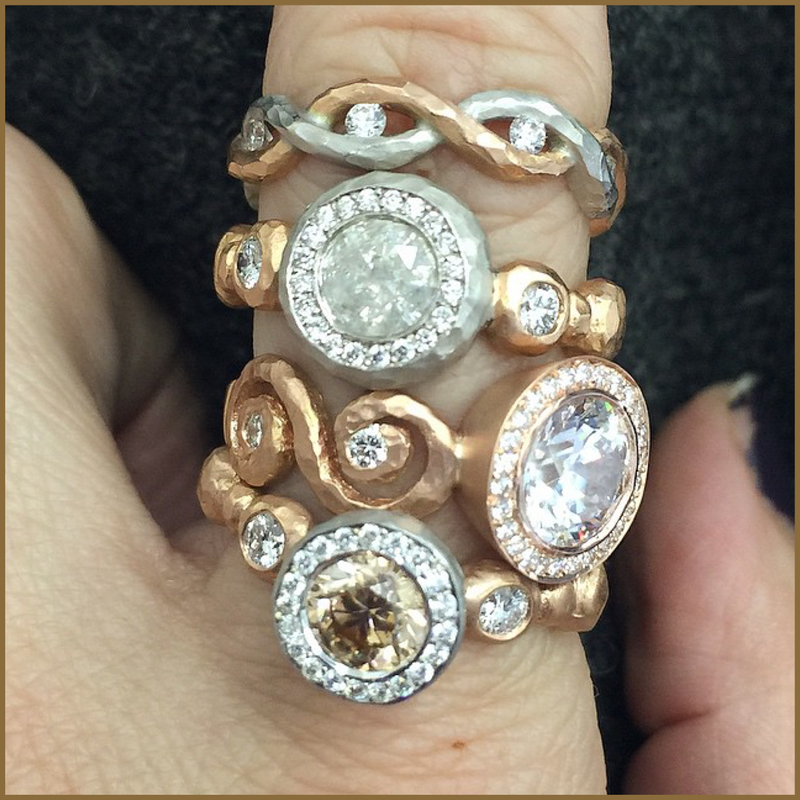 Of course, Pamela is already known for creating versatile jewelry styles that can easily go from day to night but this transformational ring design definitely takes versatility a step further. And guess what? 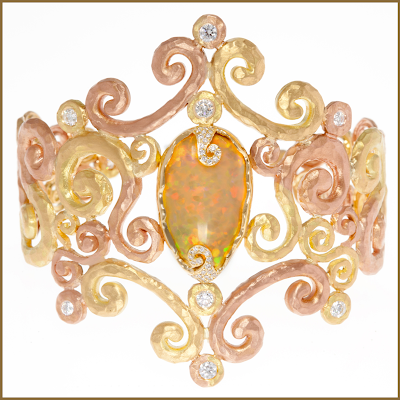 This award-winning design is actually part of a whole new Pamela Froman bridal line that is currently in the works! 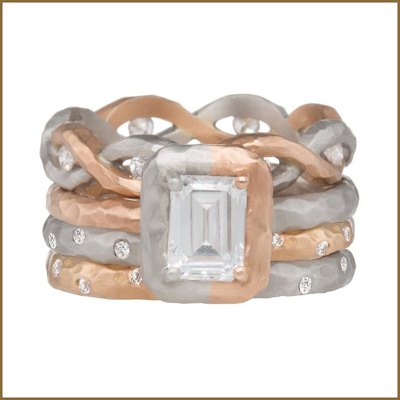 Pamela's collection has always included one-of-a-kind bridal styles, in fact the cornerstone of her very first collection was a custom-designed Platinum and 18k yellow engagement ring created for an actress who requested “something distinctive and elegant.” She is now expanding her bridal offering to include a variety of mountings for traditional diamonds as well as even more one-of-kind engagement rings and an assortment of bands for both men and women. 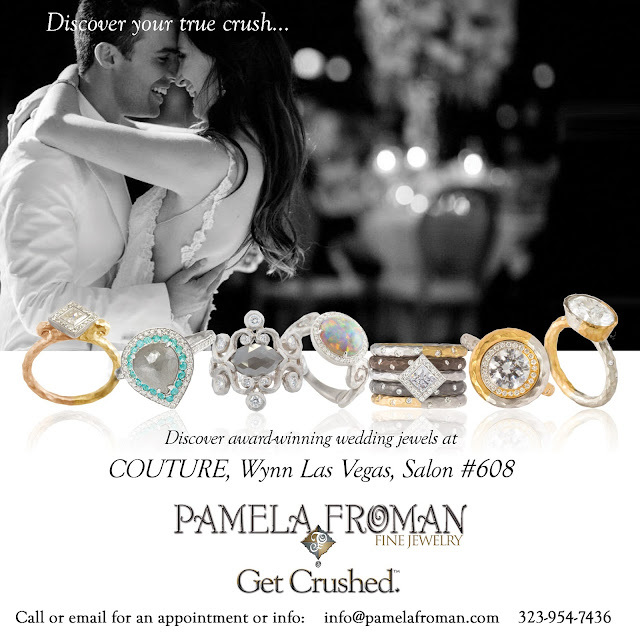 The new Pamela Froman Bridal collection will debut at the Couture show in Las Vegas this May so stay tuned! Ring in the New Year with Pamela Froman Bridal! 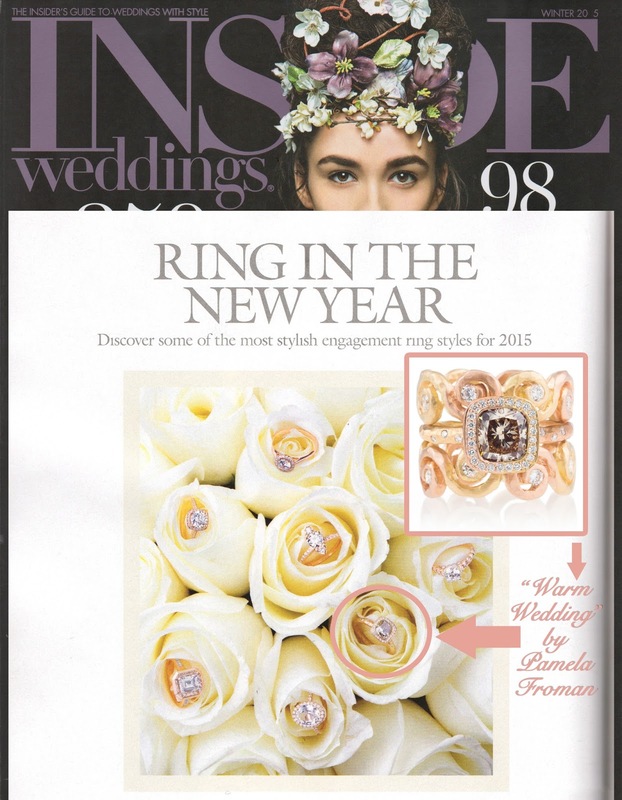 Pamela's one-of-a-kind "Warm Wedding" solitaire was selected for an Inside Weddings feature on the most stylish rose gold engagement rings for 2015 but this ring is more than just rose gold! 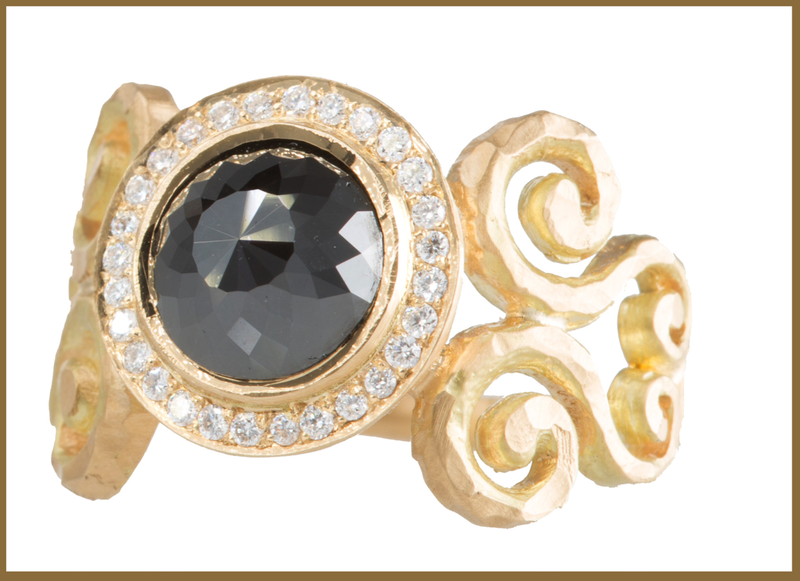 When creating this ring Pamela alternated her special 18k "pink" gold with her signature warm 18k yellow so that the color changes from shank to bezel and back again. (Even the bezel is two-tone!) She chose two colors of gold for this design to highlight the warmth of the unique GIA certified 1.72ct VVS2 fancy color center diamond. 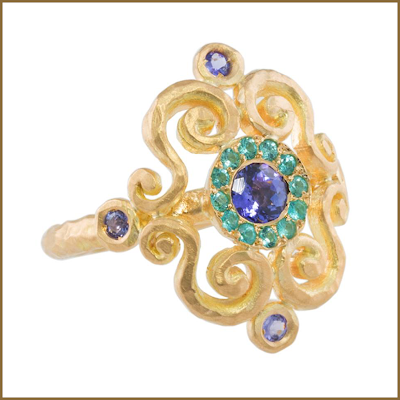 The center stone makes this ring a one-of-a-kind but the design can be recreated around other gems and in other colors of gold as well. 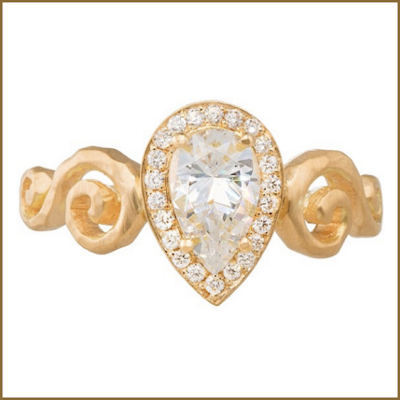 The inset we've added to the page shows the ring paired with Pamela's "Eternal Scroll" diamond bands, also in two colors of gold, creating a lacy ultra-feminine wedding set. 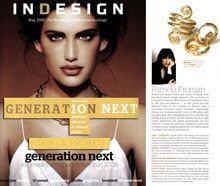 Pamela is working on many more styles for a brand new Bridal Collection to be launched this year. Stay tuned for announcements leading up to the launch date!